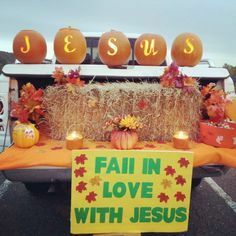 October 28th Trunk or Treat 5pm - 7pm in the church parking lot. Still time to donate candy, trunks, and time to make this a special event for the kids. October 29th Consecration Sunday: One combined service at 10am, invite a friend(s) or family member(s) to join us in worship. Children under the age of 5 are FREE! November 5th observing All Saints Day in both services. Join us in honoring those who have passed on to Heaven this past year.